"We had a skate pop up down here and people are freaking out," a Rehoboth Beach lifeguard said over the radio around 12:20 p.m. Saturday. "...keep people away from it. If they ask, tell them it's harmless. It's not going to bother them. Just don't play with it or something," another guard added. It's been an interesting past few days on the beach in Rehoboth. When skates, which are rays, swim near the surface, their fins often resemble a shark's dorsal fin. One guard on Wednesday attributed the recent skate sightings to mating season. The guards have reported fin sightings every day since Wednesday and throughout the weekend. But are all of these fin sightings simply skates or rays? When a guard on the Little Deauville stand reported seeing a shark on Thursday "pretty close to the shore," Capt. Kent Buckson may have sounded skeptical. "Are you sure it's not a skate or a ray?" Capt. Buckson asked. "It's definitely a shark," the guard said. Beach goers grabbed their cameras and camcorders, or just stood and watched as a couple fins intermittently grazed the surface for about 25 minutes in the area north of the Henlopen. Click here to hear a snippet of the lifeguards discussing what they saw on Thursday. Capt. Kent Buckson came down in the RBP Gator to look. Sharks, skates and rays are related. Here is a publication which discusses the similarities and differences. This research paper from the Nova Southeastern University documents the mating behavior of southern stingrays. 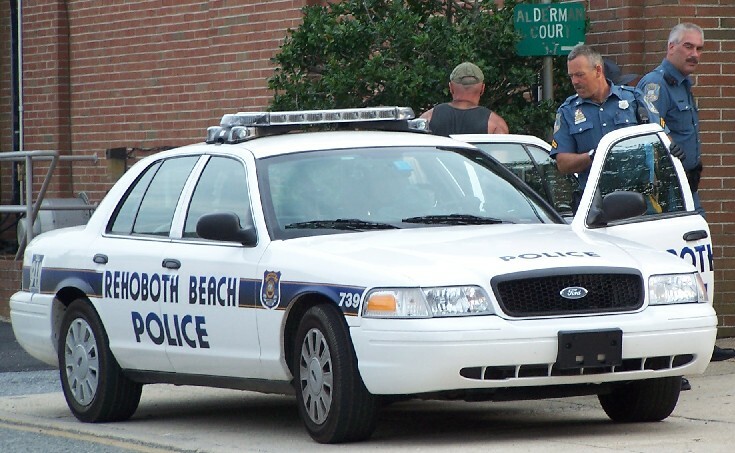 A 46-year-old man contacted a seasonal police officer around 6:25 p.m. in the area of the Rehoboth Beach bandstand. He claimed he had seven outstanding warrants and two parole violations and wanted to turn himself in. The officer ran the man through the computer, and placed him under arrest when it showed he was wanted. The suspect (in the black tank top) was taken to the police station in handcuffs for processing. The 274-meter Greek-flagged Filikon (right) passes the 280-meter Liberian-flagged M/T Miltiadis M II this past week. The picture was taken when the tankers were about three and four nautical miles northeast off Rehoboth Beach. LOCAL AMATEUR RADIO FIELD DAY, BIG HIT! 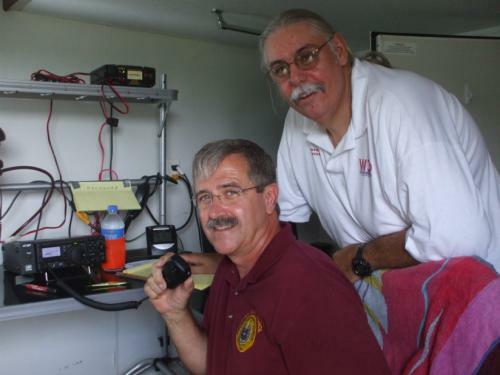 Members of the Sussex Amateur Radio Association (SARA) and the Nanticoke Amateur Radio Club (NARC) participated in the American Radio Relay League's annual Field Day event this past weekend. Using special radio call sign W3D, local radio operators contacted more than 1200 unique ham radio stations in 42 states and five Canadian provinces during a 24-hour period. From the grounds of the Marvel Carriage Museum, members constructed ham radio stations using personally owned equipment and assets to exercise their ability to communicate should commercial power and/or communication ever become disrupted. Below: SARA member Bill Hammond (W3IOD) demonstrates radio equipment to County Councilman Lynn Rogers. 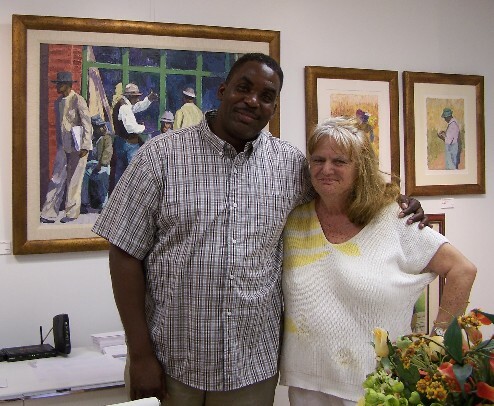 Dane Tilghman and Dagmar (Alan's mother) during Tilghman's opening Friday night at the Philip Morton Gallery in Rehoboth Beach. Tilghman is presenting his "sports" series in addition to more new works from his "Americana" series. WHITE OR ALBINO SQUIRREL IN NORTH REHOBOTH? Dennis Forney, publisher of the Cape Gazette, recently wrote about the white squirrels of Rehoboth. "According to information gleaned from the Internet," Forney wrote, "white squirrels have brown eyes, which differentiate them from the more rare albino squirrels with characteristic pink eyes. As such, the white squirrels seem to be some kind of subspecies." He says Brevard, North Carolina makes a big deal out of its white squirrel population with a festival and shops. 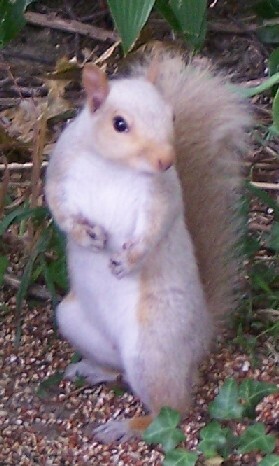 Other places with large populations of white squirrels include Marionville, Missouri; Western Kentucky University; and Exeter, Ontario in Canada.